Tetsuo Yukioka, managing director of Tokyo Medical University, left, and Keisuke Tomizawa, a representative of the head of Tokyo Medical University, behind, bow during a press conference Tuesday, Aug. 7, 2018, in Tokyo. An internal probe reveals rampant score rigging on medical entrance exams to restrain the number of female doctors. Over the course of a decade, aspiring female doctors who took entrance exams at Japan’s most prestigious medical college are finding out their results were deliberately marked down to curb the intake of female medical students. On Tuesday, Tokyo Medical University (TMU) confessed to tampering with the exams of all female applicants, subtracting results by 20 to 30 percent while adding 20 percent to male counterparts in the effort to suppress women from exceeding the universities’ self-imposed 30 percent quota. Meanwhile, male applicants who sat entrance exams for the fourth time had marks deducted to prevent students of an “unworthy” caliber from finally succeeding. The malpractice of excluding successful female candidates is estimated to have begun in 2006, but there are suspicions women’s scores were manipulated much earlier, with the ratio of women passing the national medical exam hovering at only 30 percent for two decades. The university also admitted to padding the examination marks for some students who were the children of important TMU alumni in exchange for donations. The controversy was unearthed last week by internal lawyers investigating a bribery scandal by top Tokyo Medical University executives and a senior education ministry official, Futoshi Sano, whose son was offered backdoor admission in the way of an additional 49 marks on the national medical exam in exchange for securing a government subsidy. All three men have been indicted. Score manipulations were orchestrated by former Chairman Masahiko Usui and President Mamoru Suzuki, who reasoned that female physicians would cause doctor shortages at affiliated hospitals in abandoning medicine to pursue marriage and child rearing responsibilities. Before the “silent operation” was introduced, female enrollment at TMU was edging up 40 percent, which triggered institution heads to create a manual instructing examiners how to specifically manipulate points to avoid detection, an inside source has disclosed. 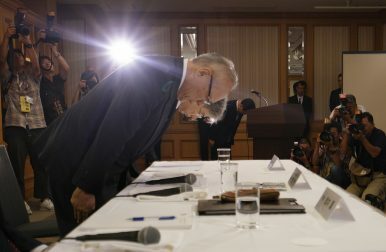 The latest revelations are a new low in a string of misconduct scandals in Japan which have made international headlines, this time showcasing the country’s ingrained attitude and systemic culture of sexual discrimination. While TMU explained their decision was an “unavoidable” response to shortages in areas such as surgery that require staff to be on standby, instead of introducing flexible working conditions to accommodate female physicians juggling motherhood, TMU’s operation demonstrates a double standard for women in Japan who need to jump higher hurdles to enter medical school. The scandal has sparked outrage, opening public debate on the value of women’s societal contribution where instead of supporting women in their careers, TMU has reinforced the notion that women are a waste of investment and are better off bearing sole responsibility for domestic and child rearing tasks. The Minister for Women’s Empowerment, Seiko Noda, described the TMU’s decision to take the situation into their own hands as extremely alarming, announcing a nationwide overhaul of female discrimination at all medical universities. This year’s national medical exams unveiled that only 30 women had ‘successfully’ passed compared to 141 men. At a press conference on Tuesday, TMU Managing Director offered a public apology for breaking applicants’ trust and pledged to make next year’s exam fair.